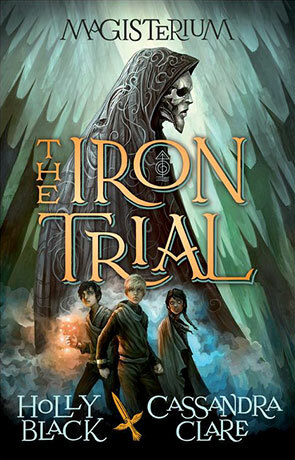 The Iron Trial focuses on the students of the Magisterium, an academy for those with magic. In this first book, a new student, Callum Hunt comes to the Magisterium against his will—but is it because he is destined to be a powerful magician, or is the truth more twisted than that? Well, let me just answer that very obvious (and rhetorical) question: the truth is, absolutely, more twisted than that. I read The Iron Trial within two days—it’s a quick read. The book kept me curious, though the plot followed a fairly predictable path until the big twist at the very end (even though wasn’t really that shocking). I’ve always loved Black and Clare’s writing, even if it isn’t always great classic literature. The Iron Trial is what it is—a fun, quick, enjoyable read. When I checked the book out on Goodreads, I it getting a lot of flak for being a Harry Potter ripoff (at least that’s what people are guessing, as it isn’t out yet. I was lucky enough to get an Advance Reader copy in exchange for this review). And okay, Sure, if you DIG REALLY DEEPLY, you can claim that it’s similar to Harry Potter. Main character fights against evil. Girl and boy best friends. He goes to magic school. But for me, the similarities end there (and, let’s be honest, it just isn’t fair to the book to compare it to Harry Potter). There is no way that anyone is going to be able to write about magic schools without them being compared to Harry Potter, and that in no way devalues the book. I enjoyed the characters. The main character, Callum (referred to as Call), is intriguing in his magic and character. Tamara, Callum’s friend, seems irritating and pompous at first, but as layers are gradually peeled back we discover that she is much more than that. Aaron, who seems to be the golden child, is interesting and complex. Their teacher, Master Rufus, is enigmatic in his actions (for example, his initial teachings involved sifting sand while other students learned how to really use magic, but the focus they learned proved invaluable). In short, if you’re looking for a quick, good, entertaining YA read, why not pick up The Iron Trial? Written on 3rd September 2014 by Vanessa.